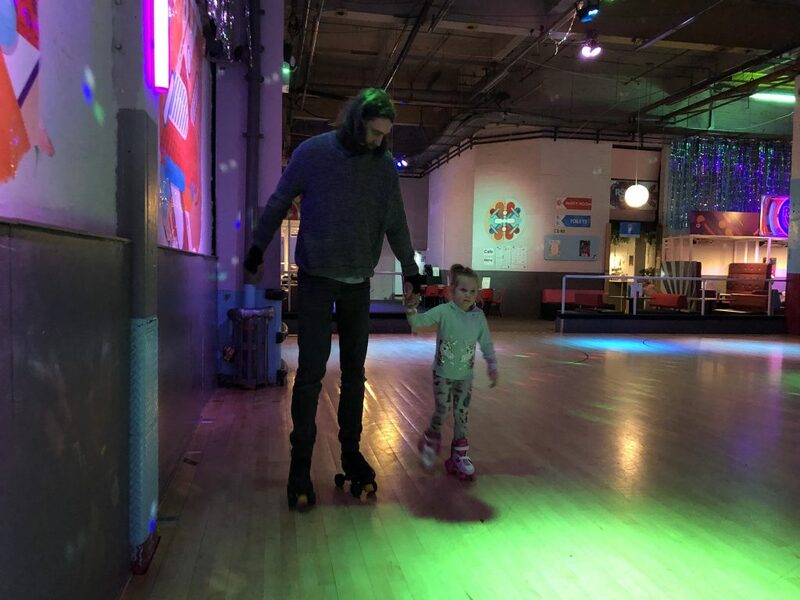 The little lady got some roller skates from Santa for her Christmas and I thought the best place to get used to them would be a lovely flat surface. 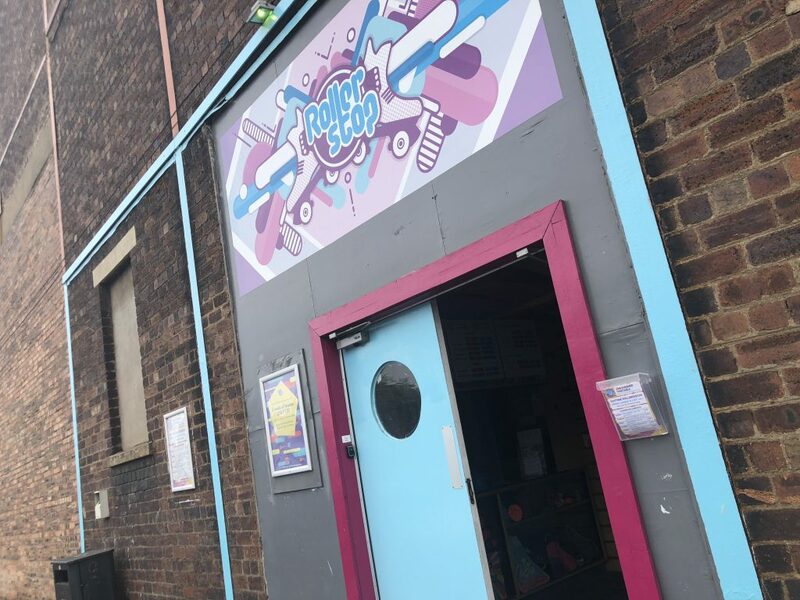 From what I’d heard, Rollerstop in Kinning Park sounded like the perfect place, so we went along to try out one of their roller discos last week. Rollerstop is basically a big warehouse building with a roller rink taking up most of it, and a cafe the rest. 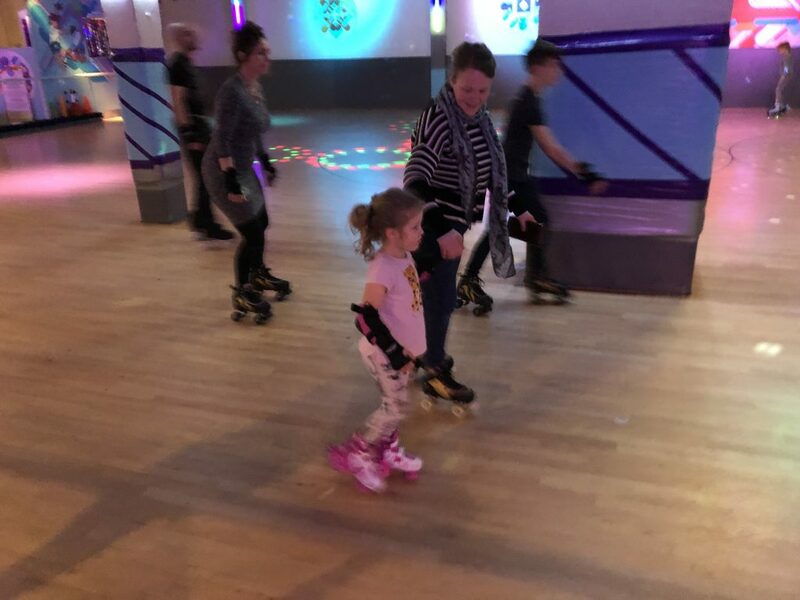 You can get skating lessons, but their main fayre are their roller discos. We went along to to their Friday evening disco after school a few weeks back; husband, the little lady and myself. We went quite early to make the most of the time we had before picking baby boy up from Nanny’s house, so we were there for about 4.30. When we walked in past the front desk we could see the dance floor and the disco ball twirling and the disco lights flashing and we could hear a soundtrack crammed with upbeat hits. There were only a few people already skating in the rink when we arrived so we got our skates on and headed straight onto the roller rink. You can stop and start skating whenever you like during the session. We mainly stopped for water breaks (actually tea and milkshake breaks) and then slightly later some pizza when the little lady got hungry. We ended up having a table in the cafe the entire time which we just headed back to whenever any of us needed a wee rest. Every so often throughout the session there were some games. There was a limbo game where you’d skate limbo (bending down, not backwards) under a light up rod held by one of the stewards; there was a game where you’d to skate in and out of the cones – like I remember doing dribbling a ball in P.E. ; and there was a team relay race from one end of the hall to the other, collecting a big blow up giraffe and skating back to your team with it. We had great fun playing those games – all of us. The little lady had a go at all of them! I’ve only ever been to one roller disco before, back in my pre-child days. That was the last time I was on skates, so I was a bit apprehensive about getting on them again. My husband hasn’t ever been on roller skates. We used to go out on our roller blades a bit, like eighteen or so years ago. (Yep, we were super cool back in the late 90’s.) So he was slightly apprehensive as well! I’m glad to report that we were both totally fine. I did feel a bit like bambi at first wobbling my way round the skating rink but after a few minutes I was back skating like my 12 year old self. It was probably mostly the nostalgia but it felt amazing skating round there with the wind in my hair. (It wasn’t windy; I was clearly just going *that* fast…) I had a great time! By the end of the disco husband and I were racing round the place! But anyway. It wasn’t really about us. 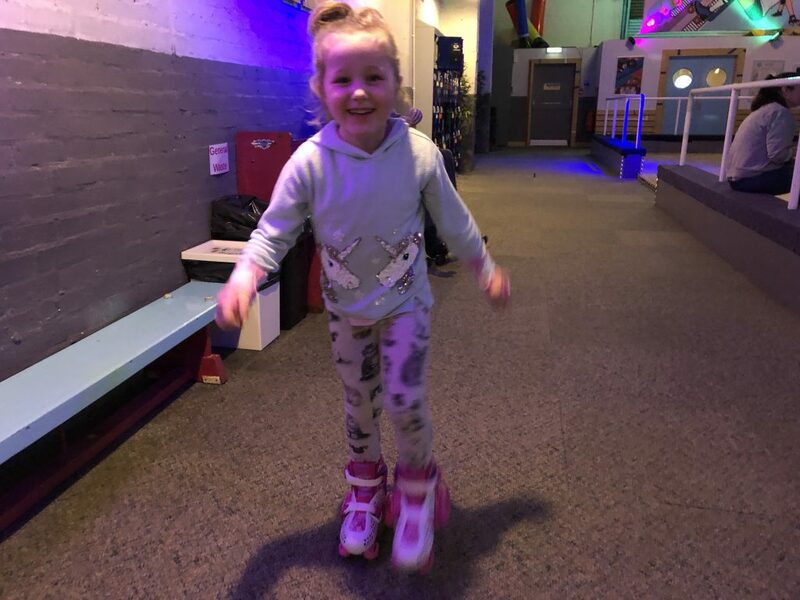 The little lady had only ever been on roller skates once before, and about half an hour into this session she was happily plodding round the rink totally by herself. As soon as the little lady went to step onto the rink for the first time one of the stewards was over to chat with her, help her stay on her feet (its all about bending the knees) and tell her how to get moving on her skates. The stewards are out on the rink the entire time helping you up if you fall and making sure you aren’t struggling round the place having a miserable time. They kept coming back to check on the little lady, giving her some tips (which she listened to; had it been me who gave her tips that would not have happened!!!) and making sure she was enjoying herself. I watched the stewards interact with almost everyone; and constantly going back to kids (and adults) who weren’t very confident or who were struggling to stay on their feet. They were so friendly, great with kids and just absolutely wonderful – seriously. For a disco, it’s not too noisy. It’s not like The Garage on a Saturday night (not that I’ve been there in a while). You can still chat easily. The cafe at Rollerstop mainly serves up woodfired pizzas and milkshakes. The little lady was hungry after about an hour of skating, so we had a margarita pizza and it was delicious. Proper crispy base and all. 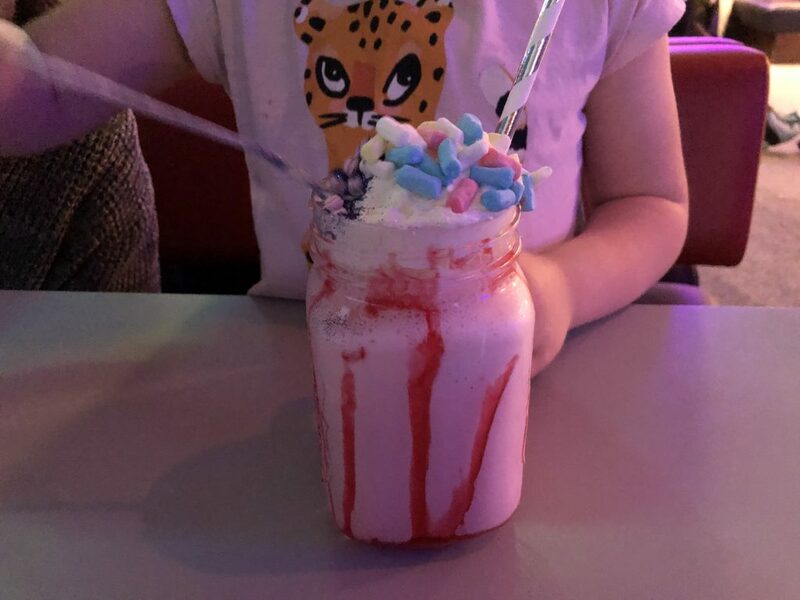 They have an impressive milkshake menu with everything from a regular banana milkshake to bubblegum flavours and shakes covered in popping candy and marshmallows and glitter. The little lady had a Unicorn Magic shake and she loved that thing. I don’t drink milk at all (the only food I’ve just never liked) but I had a taste and it was actually really good. They also serve up sundaes, smoothies, ice cream, hot drinks and some snacks like toast & jam. Check out the Rollerstop website for up to date deals. Rollerstop is for kids ages 4 and over. They have lockers for you to pop you bags in. These take 50p’s if I remember. (You get your 50p back). It’s definitely worthwhile wearing some wrist guards. You can borrow them from the skate hire if you don’t have your own, or if you’re hiring skates anyway. You can also get elbow and knee guards from the skate hire desk. The little lady wanted these at first but then ditched them an hour into our session once she had a bit of confidence. 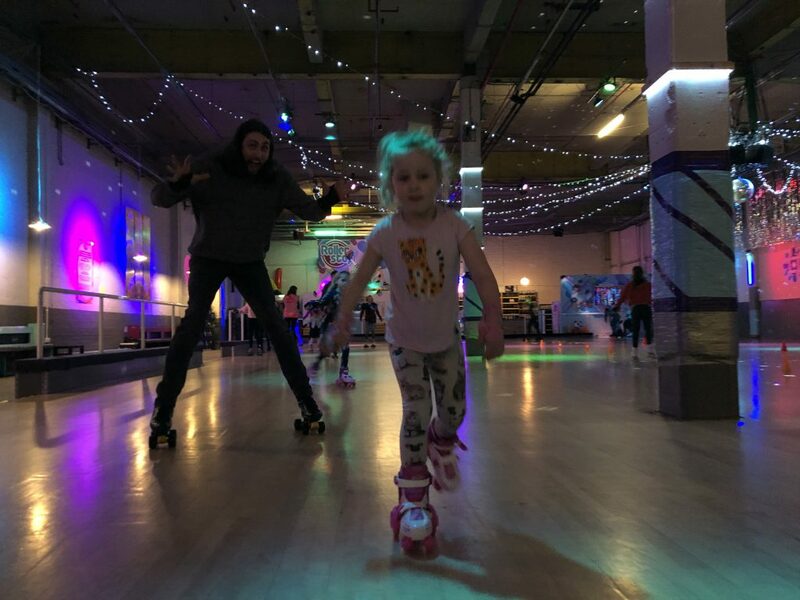 For the avid skaters they also do a monthly pass for £20 where you can go to as many of the family roller discos as you like. 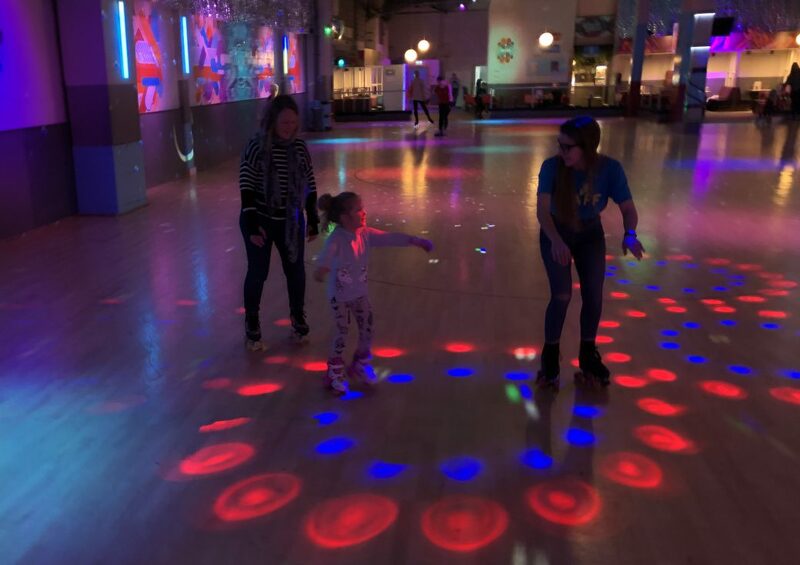 We all had a fantastic time at Rollerstop. The disco was great fun and we loved joining in the different games. The pizza and milkshakes in the cafe were nice. The staff were absolutely amazing with the little lady; they basically taught her how to skate in that one session. (She was on form that day – had it been a different day and a different mood it could’ve been a different story.) They were so friendly though and so attentive to anyone who wasn’t very confident. I can’t rate them highly enough. 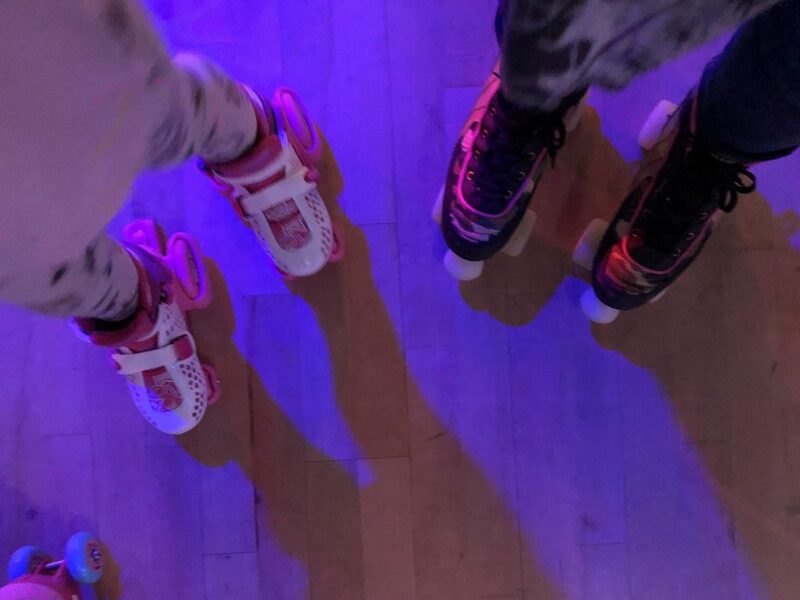 Roller Disco’s are brilliant fun, and Rollerstop is a brilliant place. The little lady’s new favourite! Rollerstop is located in Kinning Park at 139 Middlesex St, Glasgow, G41 1EE. It’s just next to Wonderworld Soft Play.